Opportunity to embark on an epic journey that our mountain legends Sir Edmund Hillary and Tenzing Norgay Sherpa set off on in 1953. Island Peak (6189m) is one of the most popular trekking peaks in Nepal for climbing on which is situated in Khumbu region. It is also known as Imja Tse. This ‘Island Peak Climbing Trek’ includes both trekking in the heart of Khumbu region and to climb the Island Peak. Island Peak (6189m) is one of the most popular trekking peaks in Nepal for climbing on which is situated in Khumbu region. It is also known as Imja Tse. This ‘Island Peak Climbing Trek’ includes both trekking in the heart of Khumbu region and to climb the Island Peak. Trip provides enjoyable climb as well as provides some of the most spectacular scenery of Himalayas in the Everest region. From the top of Island peak, you can see the giant mountains such as mount Nuptse (alt. 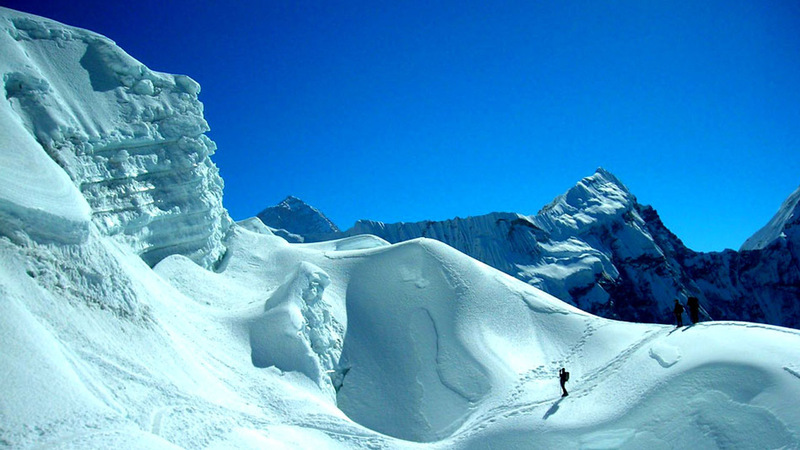 7879m),mount Lhotse (alt. 8501m), Lhotse Middle Peak (alt. 8410m) and Lhotse Shar (alt. 8383m). Also you can see the views of Makalu (alt. 8475m) in the east, Baruntse and Amadablam. Also on the way to Island peak, trip offers scenic mountain views, and opportunities to get a real experience into the life of world famous climbers (the Sherpa people). The trek offers the opportunities to see the Khumbu mountain ranges, around Sagarmatha National Park, a world heritage site, the life style of the Sherpa people, Himalayan flora and fauna and also will get an opportunity to embark on an epic journey that our mountain legends Sir Edmund Hillary and Tenzing Norgay Sherpa set off on in 1953. Also you’ll witness the highest altitude hotel in the world, The Everest Hotel, highest altitude airport in the world and highest place where still people live there.